Skip the store-bought card this year. Instead, add personality and individuality to your Mother's Day by going totally DIY with Mom's card. Get started with these 20 ideas, then let your imagination run wild! We are positive the gesture will go a long way in Mom's eyes. This whimsical coordinating card and stationery set is perfect for Mom this year. The pops of aqua are absolutely on-trend, and the printable stationery makes for an easy homemade gift. Get wordy with a font-forward card. The earth tones in this design look stellar printed on natural paper, and as a bonus, download a matching gift tag for a fully coordinated present. You'll need to print this card out double-sided, but the final product is definitely worth it. Personalize your own message on the inside of the card, then wrap it all up neatly with the watercolor paper petals. Seal the card with a matching sticker and you're good to go! Tap in to Mom's funny bone this year with these winky cards. Perfect for the family that enjoys a good laugh, this set of printable cards is sure to bring joy to your gathering. Print a few of these cute little circular tags to construct a card, DIY a gift tag or two, or assemble a simple cake topper. Vary your paper colors and layers to experiment a bit with this simple, pretty design. Perfect for the artistically-inclined Mom, this lovely printable design looks so close to hand painted that it's sure to impress. Up the ante and add a gift of original artwork or a lovely set of painter's brushes. Delicate cover art leads the way for a personal message inside this printable, colorful card. 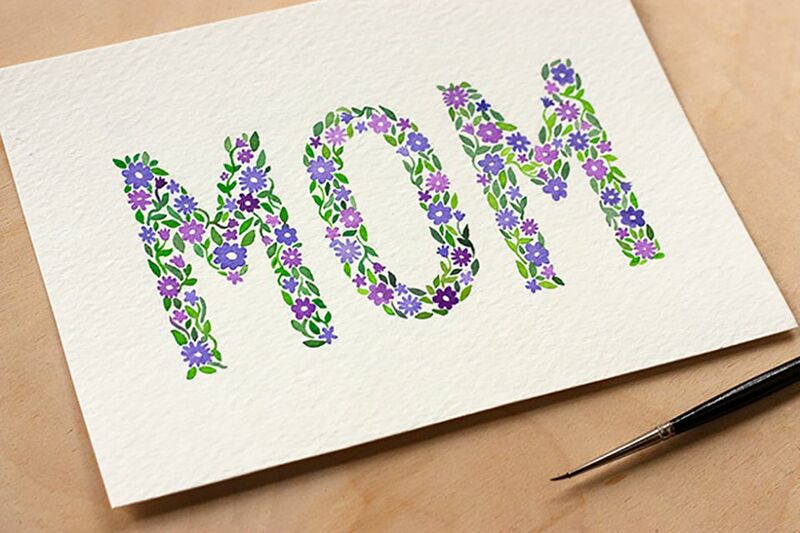 Grab your embroidery tools and stitch a greeting for Mom directly into heavyweight paper. This tutorial provides a nice refresher for simple stitches, so it's a great project for first-time embroiderers. A perfect DIY option for little ones, this cut-and-paste construction paper card ends up looking not only super sweet, but also quite professional. Pro tip: use card stock for a sturdier craft with layers that really pop. Create a true keepsake card with a bit of crochet. Choose coordinating yarn, crochet a couple of simple flowers, stitch together, glue to card stock, and finish with a contrasting scalloped edge to bring it all together. Not only is this card a quick print-and-go, but it includes an on-theme option for a little gift as well. Finish the present with a gift card for a mani/pedi and truly make Mom's day! Break out the patterned paper and fold your way into Mother's Day. Simple origami techniques come together to form letters in this original card. Kiddos can definitely take part in this one-it's easy enough for little hands and and utilizes a handy template. Just be sure to use a plastic safety needle if your little ones are participating, and get ready to create a lovely piece of art together. Create your own washi tape appliques to pop onto the front of your card this year. Add a contrasting envelope and you've got a polished, handmade gift for Mom. Add both texture and sweetness to your Mother's Day cards with pastel pom poms. Design a happy Momma penguin and her chicks or create a whole jar of glowy fireflies. A perfect use for those spare buttons gathering dust in your sewing box–glue a cluster onto colorful construction paper and add a stem to complete the effect. This is another excellent option for children–no messy paint or tricky cuts needed. Combine your Mother's Day card with a fun dessert activity to celebrate sweetly. Baggie toppings (think: rainbow sprinkles, mini marshmallows, or chocolate chips) and tape to the front of your card. Just add a scoop or two of ice cream and you're ready to party! Prep your brushes and watercolors and practice your florals to replicate this stunning card. Paint teeny leaves and buds to fill a few graphic letters on the face of the card for a dynamic visual. Devise your own special message for Mom, and use a craft knife or Cricut machine to cut letters into a piece of colorful cardstock. There are limitless options for text here, so get mushy and personal or flex your funny bone. This DIY Mother's Day card plays off a cute pun to make your mom feel special and appreciated. She'll love the tiny details and the sweet sentiment of your message to her. All you'll need is cardstock, mini models, pinking shears, and glue.